Andsolis is a German/Dutch Progressive Melodic Death Metal band. They’re releasing their first album ‘Vigil’ on January 23, 2015. The album contains 7 tracks and starts with the track ‘Stand Vigil’. This track starts with a mysterious sound that makes you wonder what comes next. Within a few seconds you get your answer: A blast of Progressive Death Metal which really keeps your ears to the record. 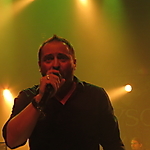 The album also has more Melodic songs like ‘The Laughter Echoes’. The switch between these styles really makes you want to listen to this album over and over again. Vigil is a period of staying awake during the time you normally spent asleep. Conclusion: the name of the album really suits it as my ears can’t get enough of it.